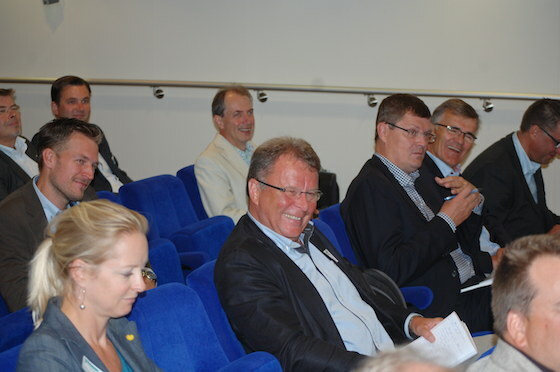 Midway Alignment of the Bothnian Corridor arranged a conference onboard M/S Wasa Express on 21st August, with most of the project’s action partners and supporting organizations attending. Representatives from the Finnish Centre for Economic Development, Transport and the Environment and the Swedish Transport Administration were also present. The purpose of the conference was to provide information on the current situation and developments in the project. – The European Commission granted TEN-T funding for this project in October 2013.We had the official kick-off in mid-December 2013.Now we can proudly say what we have accomplished since, says Mikael Öhlund, chairman of the Midway Alignment steering committee as well as managing director and CEO at Umeå kommun. – The first phase of the project focuses on planning and developing a new ferry for the Kvarken Strait. But the project is much more than just a new ferry. We aim at integrating two thriving regions and also larger entities, and at creating a transport concept. Further, we concentrate on developing the ports and logistics. Passengers and freight require quick, smooth and ecological transport systems. In this way, we can achieve further growth and the regions can gain in strength, which is good for both Finland and Sweden as well as for the European Union, Öhlund adds. The project has now reached the phase where Midway Alignment has signed a contract with Wärtsilä to design the new ferry. Midway Alignment is striving at building a modern, innovative and environmentally-friendly ferry which meets the needs of both passengers and of trade and industries. – As yet, the passenger capacity is still an open question. But we will use new technology and innovative materials to build a light, strong and energy-efficient ferry operating with environmentally-friendly fuel. With the help of Wärtsilä’s expertise we will achieve a very good solution which will meet the needs of both our regions, emphasizes Mathias Lindström, project manager of Midway Alignment and director of the Kvarken Council. – We have worked hard to reach this point. Most of the analyses aiming at ensuring that everything is done right from the very beginning, are now ready. We do not intend to just throw a solution that we believe is good but, instead, we have conducted a number of analyses to find out the underlying facts and actual needs. Environmental analyses, surveys of the needs of trade and industry, analysis of goods and passenger transport are some examples of the analyses that have been forwarded to the steering group, says Tomas Sikström, infrastructure strategist at INAB. – Although we are entitled to feel proud of what we have accomplished so far, we need to remember that there is still a lot of work to be done. Phase 1, including all the planning, has its funding covered and it will continue until the year-end 2015. Phase 2 includes the building the ferry as well as the required harbour, road and railway investments. The application for Phase 2 funding is under way and keeping us very busy, Sikström adds. EU regards this project as strategically important in order to strengthen the Bothnian Corridor network and puts great value on the fact that local industries are now active participants in the project, together with municipal, regional and national actors. The project is a manifestation of smooth and natural cross-border cooperation where the two countries are united in a shared goal on both sides of the border. Midway Alignment of the Bothnian Corridor is a cooperation project between public and private actors on both sides of the Kvarken Strait. The main purpose of the project is to upgrade the transport route across the Kvarken Strait between Finland and Sweden in order to fulfil international requirements for an environmentally and economically sustainable transport system with increased multi-modality and higher transport security. The project includes activity groups to develop a complete transport system for both goods and passergers and it was initiated by the city of Vaasa in Finland and the city of Umeå in Sweden. The Midway Alignment project is funded by municipal, regional and national financiers from Finland and Sweden, by private companies and European Union TEN-T Call funds.